New study: What would happen to the climate system if Earth turned the other way around? To further improve our fundamental understanding of the effects of the topography and rotation on the climate, a team of scientists performed and analyzed simulations with the Max Planck Institute Earth System Model (MPI-ESM), in which the rotation of Earth is reversed (retrograde). Their findings were recently published in Earth System Dynamics. 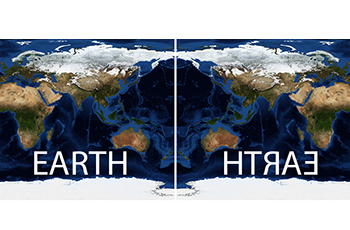 The rotation of Earth shapes our climate system in various ways: It controls the major wind directions, lets the weather systems swirl, and, together with the topography, it creates strong ocean currents. Many other features of the climate system, like the monsoon systems and the meridional overturning circulation in the ocean arise from complex interactions within the climate system, and their exact dependency on the topography is hard to pinpoint. The reversal equals the creation of a mirror-image of the topography. It conserves all major properties like the sizes of continents and ocean basins while creating vastly different conditions for the interactions between topography, weather systems and ocean currents. As these interactions affect all parts of the climate system, a diverse team of 20 scientists from the Max Planck Institute for Meteorology (MPI-M), the German Climate Computing Center, and the Universities of Hamburg and Reading combines their expertise in all parts of the climate system for the analysis of the simulations. The changes they observed in the climate system were partly expected by them based on classical theories, but partly surprising. Wind patterns change, the direction of the ocean gyres reverses and they shift, a strong reorganization of the Intertropical Convergence Zone (ITCZ) takes place, the meridional overturning circulation (MOC) relocates from the Atlantic into the Pacific. Mikolajewicz, U. et al. The climate of a retrograde rotating earth, Earth Syst. Dynam., 9, 1191-1215, 2018, doi.org/10.5194/esd-9-1191-2018.